My grandpa Miller used to jokingly (or maybe not-so-jokingly?) say "san'rich" instead of "sandwich." He also made the distinction between a SMALL san'rich (which is one piece of bread folded in half to make a sandwich), vs a HALF san'rich (which is a full sandwich, cut in half). Call it what you want, but I think you might want to eat this WHOLE Grilled Eggplant & Red Pepper San'rich which is now officially at the top of my fave flavor combos list with a blog post to prove it! Back in the day when I worked at an ad agency in NYC, there was a cafeteria in our building that had a million options. Let’s see if I can remember… there was like a grill situation where you could get burgers and what not, a sushi station, a salad bar where you could get a $20 salad, a station that had specials that sometimes included something called Sizzlin’ Salads (basically stir fry on top of a salad), a pizza station with a great 2-fer deal, AND a deli. So anyways, there wasn’t much point in listing all of those except to see if I remembered. BUT, that last one, the deli station, had a sandwich special which wasn’t on the regular menu and if memory serves me correctly, the special was cheaper! I usually brought my lunch from home, but on occasion, I’d go all out and get lunch from the Ogilvy caf. Because, #treatyoself, ya know? And it was one of those days, when I bought a sandwich from the deli counter, that I discovered this fantastic combination: roasted eggplant, roasted red peppers, and goat cheese on a hoagie roll. SO simple, yet SO delicious! So here’s my take! I decided to dress up the goat cheese by making it into a spread with garlic and basil, and I’m not sorry about it at all! I went straight up, white bread, hoagie roll for this recipe; because if you’re gonna make a sandwich, make a sandwich. But feel free to do whole wheat, or sweet potato buns, or wraps, or whatever you’re feelin! For a regular hoagie roll, you'll want 4-5 slices of eggplant. For 4 sandwiches, I used 2 medium-sized eggplant, cut into about 1/2-inch slices. It will be way easier to mix the basil and garlic into the goat cheese if it's soft, so let it sit at room temp while you grill the eggplant and peppers. If you don’t have access to a grill, you could toast the rolls, roast the eggplant and peppers, or cook them on a grill pan or even a regular skillet. The grill is super easy though with hardly any clean-up soooo… Grill if you can grill! IF you don’t like goat cheese, I recommend a Whipped Feta Spread, executed beautifully by my friend Andrea! Alt instructions for that are listed below the recipe. 4 hoagie rolls or whatever bread or non-bread you choose! Slice eggplant into thick slices (about 1/2" thick or a little under). Cut the sides off of both peppers so you have 6-8 "slabs" of red pepper. Finely mince 3 cloves of garlic - you want tiny tiny pieces. Separate out 1/3 of the minced garlic and reserve it for the goat cheese. TIP: To get the garlic super fine, chop it until it's about as small as you can get it, then sprinkle with a bit of salt and use the back of a knife to grind it into the cutting board, making a paste. Add eggplant and pepper slices to a large bowl. Sprinkle the garlic over (about 2 cloves), drizzle with olive oil and balsamic (no need to measure much here), and quickly toss to coat. Season lightly with salt and pepper. Sit them aside to marinate while you preheat the grill to medium-high heat. Fold a paper towel over a couple of times and saturate the folded edge with olive oil. Once the grill is pre-heated, use grill tongs and the olive-oiled-paper towel to grease the grill grates. Place eggplant and pepper slices on the grill. Cook eggplant for 3-4 minutes per side or until tender, but you don't want it to be mushy! Grill peppers for 6-8 minutes per side or until soft. TIP: I prefer the peppers to be pretty tender, similar texture to roasted red peppers. They will continue to cook and soften after you take them off the grill so keep that in mind. And keep an eye on them; they burn quickly! Add sliced hoagie buns to the grill for 1 minute per side, just to get some light toast action. To make the Garlic Basil Goat Cheese, add about 4 ounces of softened goat cheese to a small bowl. Season with about 2 Tbsp of chopped fresh basil and the reserved garlic (1 clove, finely minced). Drizzle with a little olive oil and combine everything with a spoon until smooth. TIP: If goat cheese isn’t your jam, see alt. instructions below for a Whipped Garlic Basil Feta. Once the peppers have cooled slightly, cut them into thin slices. To build your sandwiches, spread goat cheese mixture onto both sides of the buns. Add 4-5 slices of grilled eggplant, then top with sliced peppers. Top with the top sandwich bun and enjoy! I actually quite enjoy these sandwiches hot, at room temp, OR cold, so take your pick! They'll keep for a day or so if you wrap them up tightly in waxed paper and store in the fridge. This non-goat-cheese option comes to you from my friend Andrea who tested the recipe and highly recommends it for anyone who doesn’t like or can’t find goat cheese! Mix all ingredients by hand until well combined. Add feta, cream cheese, lemon juice, and garlic to food processor. Process until creamy and drizzle in olive oil until you like the texture. Add in fresh basil and pulse to combine. 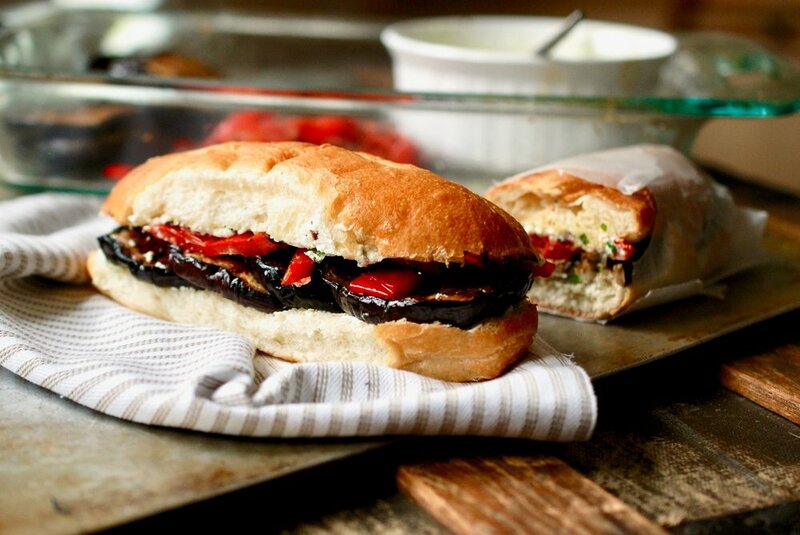 Grilled Eggplant and Red Peppers Sandwiches with Garlic Basil Goat Cheese – Maria Makes: SO simple. SO delicious. Toasted hoagie rolls layered with grilled eggplant and grilled red peppers, all pulled together with a tangy, garlicky, basil-y goat cheese spread. Follow along for wholesome eats, occasional treats, kitchen tips, and straightforward recipes. Visit Maria Makes on Pinterest. Food blog featuring wholesome eats, occasional treats, kitchen tips, and straightforward recipes.